-Guided rowing boat and fishing tour on lake Vuojärvi. Includes : private guide services, boat and safety gear rental, fishing/angling equipment, grilled sausage on open fire and hot drink during the trip. Includes : private guide services, boat and safety gear rental, snacks and hot drink "on board" during the tour. 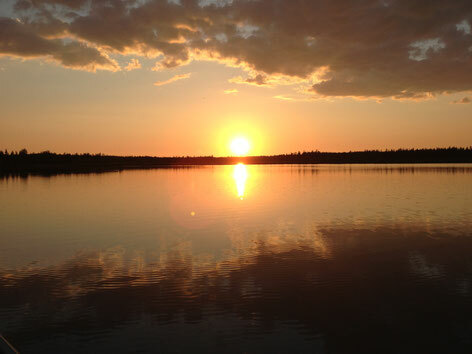 Join us for a 4 hours "fishing expedition" on lake Vuojärvi! 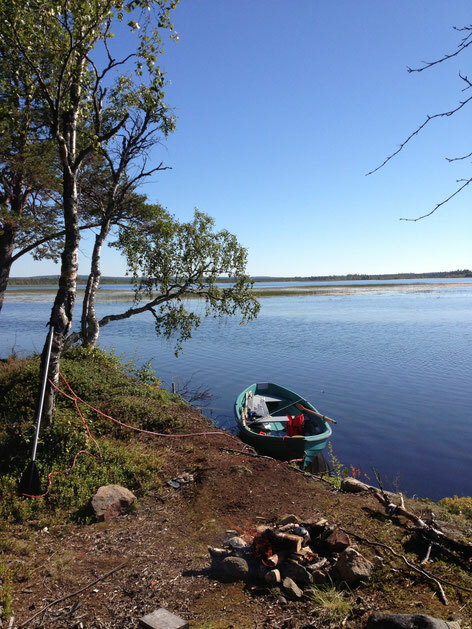 After meeting at the small village of Vuojärvi, just by the E4 road, 40km south of Sodankylä, we drive to the lake (located just 3 min drive from the village). After a short fishing intitiation from the shore of the lake ( to see if we will use spinning rods or basic angling rods from the boat), we'll start our trip. We will use a rowing boat and I will take care of the rowing, but you are very welcome to also give it a try if you want to! The lake is 360ha, very quiet, with a beautifull scenery, and has a very healthy population of delicious perches and big pikes (a pike of 16kg has been caught ice fishing in April 2017!!). We'll do little bit trolling and also fishing while anchored. At some point during our trip, we'll land to grill the famous finnish sausage (and/or possibly our catch) by an open fire. This program is available until the time when the leaves have fallen from the trees (which in Lapland corresponds more or less to the time when fishes become less active, usually late September, beginning October). It is possible to reserve this program in advance, but as it is not funny at all to sit 4 hours in an open rowing boat under a cold lappish rain, it is better to pay for the program only on the spot, once we are sure to go. This program can be organised at any time of the day, but it is usually better in the afternoon and even more during the evenings! PRICE : 120€ + 20€/person with a maximum of 2 adults or 2 adults and 1 child! INCLUDES : Private guide services, boat and safety gear rental, fishing equipment (take also your own if you have! ), grilled finnish sausage and hot drink by the open fire. After meeting at the village of Vuojärvi (starting time for the activity depends on the time of the summer, it can be from 18.00 to 21.00 depending on the sunset time). The village of Vuojärvi is located by the E4 road, 40km south of Sodankylä. From there, we drive 3 minutes to reach the shores of lake Vuojärvi, and embark for our evening boat trip. The whole program will lasts about 2,5 hours. At some point during our trip, we will stop to enjoy a warm drink and some traditional pastry while enjoying the quiet arctic evening. Like the previous program, It is possible to book this activity in advance, but the program will be run only if the weather is good enough . It means that the payment for the program will be done only at the beginning of our trip, when we meet at the village. PRICE : 80€+20€/person with amaximum of 2 adults or 2 adults and 1 child. INCLUDES : private guide services, boat and safety gear rental, warm drink and snacks on board during the trip. ... 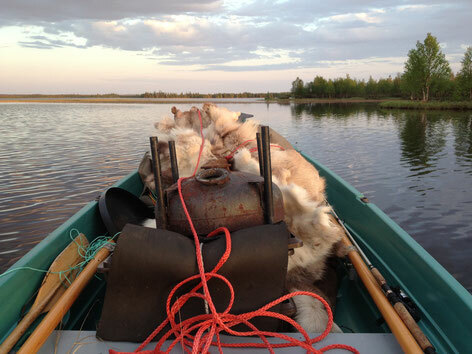 If you just want to go fishing by yourself for the evening, or to have a camping night far away from the civilisation in the middle of nowhere, you can also rent a rowing boat without any guide. We meet at the village of Vuojärvi, and drive to the harbor. The village is located by the E4 road, 40km south from Sodankylä. I show you the boat, we look together at the map, so you know where to go/what to do, and I give you my phone number in case of emergency. When you are away on your boat activity, it is possible to leave your belongings (car, camping car, bycicle) in my place (2min drive from the lake).